Home Are You On the List? Here at 365Etobicoke.com we only feature the very best that Etobicoke has to offer. From restaurants and salons, to parks and charities, to stores and events, we cover it all. If you are involved with one of these great Etobicoke businesses or events but haven’t been featured yet, don’t worry, it’s probably because we just haven’t got to you yet. If your event or business matches the criteria of great “things to do in Etobicoke”, we’ll do a write-up and send out a photographer out to take pictures and shoot video, all free of charge. 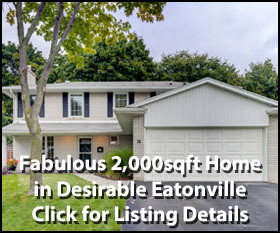 To speed the process along feel free to contact us today to get started. Let us know if any of the information on your write-up is incorrect (phone numbers, hours of operation, etc) and we’ll get it corrected right away. Link to our write-up on your website and increase your Google ranking. You can also use a badge! 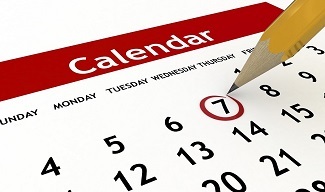 Let us know of any related promotions or upcoming events and we’ll add it to our write-up and our calendar as well as tweet it as the event approaches. Let us create a video and get added exposure. Free of charge. Consider advertising with us and generate even more traffic to your business. 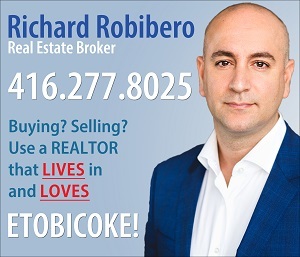 We love Etobicoke and want all of our local businesses, charities, non-profits, and events to prosper. Make sure to complete the above steps to guarantee more foot traffic to your business or event! Feel free to contact us us any time. Has your business or event been mentioned by us? Brag about it and get a badge! Put one of these 365Etobicoke.com badges on your website to let your visitors know that you’ve been featured on 365 Things To Do In Etobicoke! Simply copy the HTML for the size badge you want below and then paste into your site. These badges link to our home page, if you would like to link directly to the post where you were mentioned, click here for detailed instructions. 1) Go to the post that you were mentioned on 365Etobicoke.com. 2) Copy the URL of that post from your browser address bar. 3) Replace the first instance of our home page URL (http://365etobicoke.com/) in the code above with the URL that you copied in step 2. 4) That’s it! 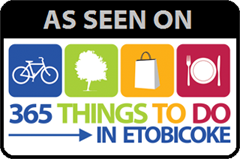 You can now let your website visitors know that you were highlighted as one of the top things to do in Etobicoke.